Preemption systems are designed to help emergency vehicles get where they need to go with minimal interference by automatically changing traffic lights to let them through. Unfortunately, many preemption systems use outdated technologies that slow down response times and even endanger other drivers. Many traditional preemption systems involve the placement of specialized emitters on emergency vehicles that generate an optical or infrared signal. These signals are received by detectors located at traffic intersections that change the lights to enable the emergency vehicles to pass through quickly without interference. A Clear Line of Sight is Required – Optical and infrared technologies require a clear line of sight to function—they do not pass through buildings, up hills, or around corners. This becomes a big problem when an emergency vehicle is coming over the top of a hill or around a steep bend in the road. In these cases, the preemption system will not be triggered. The emergency vehicle may be required to make a complete stop and wait for traffic to clear before moving forward, which can dramatically increase response times. Traffic Isn’t Cleared in Advance – Optical and infrared technologies don’t help clear traffic in advance since they’re only triggered when a vehicle is approaching the intersection. 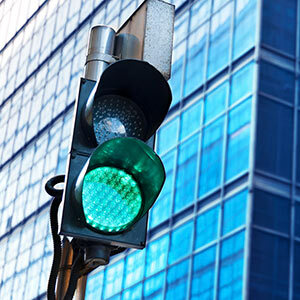 Even if the signal turns green and the emergency vehicle passes through the intersection, traffic jams could still significantly delay the emergency vehicle. This can lead to a dramatic increase in response times during rush hour and other busy traffic hours. Vulnerable to Abuse by Hackers – Hackers quickly discovered how to take advantage of simple optical and infrared technologies. In fact, the preemption transmitters were sold for as little as $500 online in the early 2000s, and the problem became so large that the Safe Intersections Act was introduced to make it a misdemeanor for unauthorized users to wield preemption transmitters—or MIRTs—and introduce even more serious penalties for those selling MIRTs. These are just some of the issues that arise with conventional preemption technologies. While optical and infrared preemption technologies are still a big improvement over nothing, new technologies can offer significant improvements to reduce response times and increase safety for everyone on the road. Cellular and radio technologies have become increasingly popular as a way to address these shortcomings of optical and infrared solutions. When combined with GPS, emergency vehicles can plan out their entire route immediately after receiving a call, and they can change traffic lights well in advance to clear out bottlenecks and ensure safe movement to their destination. The biggest problem with GPS is that microwave signals are unavailable in parking garages and tunnels. The signal can also be degraded in urban canyons and near trees due to clocked line of sight to the satellites or multi-path propagation. Emergency responders often cite the “first light” problem that emergency vehicles face after responding to a call: A fire engine might receive a call within a firehouse, or an ambulance might receive a call within a parking garage. Since the GPS can’t resolve its location until the vehicle exits the structure, the preemption system doesn’t receive much advanced warning, and the first traffic light or intersection can be late to turn green, creating a significant delay and increase in response times. Dead-reckoning GPS solves this problem using accelerometers and gyroscopes. By equipping vehicles with sensors that know the wheel circumference, record wheel rotations, and identify steering directions, the technology calculates the vehicle’s exact location and heading based on their last-known GPS location. Emergency vehicles exiting a station or parking garage will be immediately known to the entire system, despite not having a clear line of sight to satellites. Applied Information’s preemption systems include dead-reckoning enabled cellular and radio technologies (redundant communication methods designed to function in all environments), as well as unique features that aren’t found in competing preemption systems. Our preemption systems include built-in cabinet monitoring to ensure that they’re functioning normally—and they alert the right people when something isn’t working. This includes the monitoring of incoming AC power, BBS battery, conflict monitor, fan status, remote power cycling, and much more. These technologies are also offered in our other traffic solutions, such as our school beacons and parking solutions. In addition, our preemption systems integrate with the Glance Central System, which provides a browser-based interface to manage all traffic activities. It’s easy to configure priority and preemption zones using a map-based configurator, while the system supports transit priority capable controllers to keep signals in coordination. When it comes to reporting, our preemption systems enable department heads to login and see where all emergency vehicles are, where they’ve been, and what preemptions they’ve triggered. You can also see in-depth reporting data, such as total miles, average speed, types of emergencies, and average response times. This data can be used to identify problems and make changes designed to improve response times and enhance safety. Preemption systems have come a long way since the optical and infrared technologies developed decades ago. 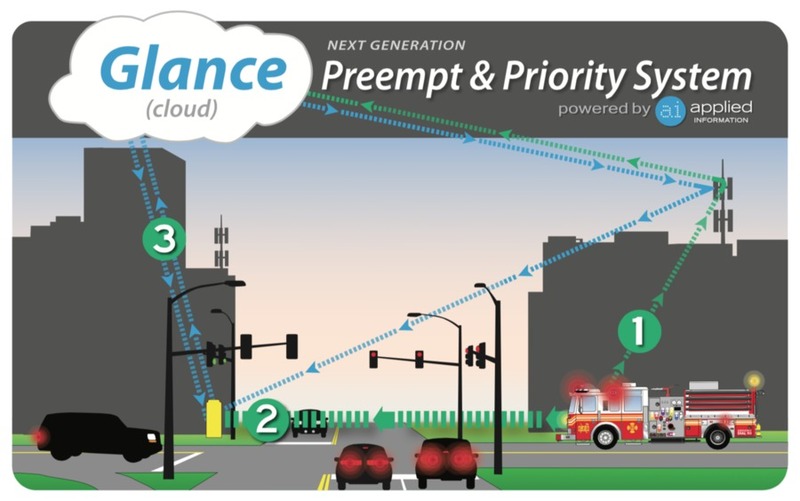 Using GPS, cellular, and radio technologies, the newest preemption systems can help clear traffic well in advance and dramatically reduce emergency response times. If you’re interested in learning more about Applied Information preemption systems, request a free consultation or download our free information kit. Use this checklist to minimize the time it takes your city’s emergency response vehicles to respond.